Well, a week ago we were going like hairy legs on the new 32 footer. 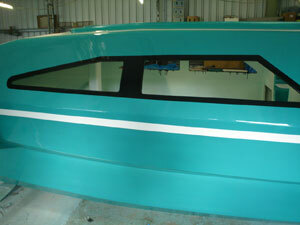 Fran was churning out 32 foot long foam and glass panels and I was constructing the first float. Now it has been raining off and on for a week sending the humidity up. We were in drought and one of our tanks was dry so now that has been rectified it would be good to go back to dry laminating weather. The first float is sitting up on the temporary frame waiting for the extra lamination of double bias cloth over the bottom panel, bilge panels and stem. All the bulkheads have been cut out. As soon as I have the extra bottom layer on the outside we will lift the hull off the temporary frame. The hull will then be turned right side up and the inside joints taped, stringer taped to the main side panel and bulkheads taped in. The deck will then be constructed but not permanently attached until the beams are fitted. Work is progressing on well on the new 32 footer. All the templates for the hull panels (main hull and floats) and templates for the float bulkhead have been lofted and cut. 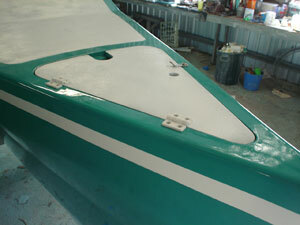 The hull templates will be assembled on the complete foam and glass blank using a string line for alignment. They will be temporarily held in down with a few gyrock screws (dry wall screws) at the edges. 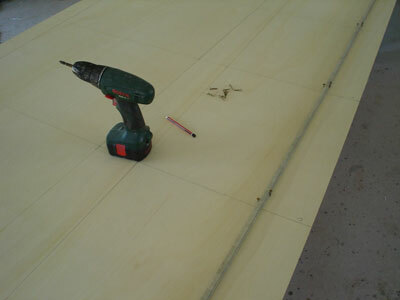 We place the screws at the edge of the panel as the edge will be taped, covering the screws holes. The temporary building frame is being constructed now using 17mm particle board. This is a bit of a back-flip as I vowed never to use MDF or particle board after having a minor flood issue in the shed some years ago. However the local source of good second grade plywood has closed up and run away, leaving particle board from Bunnings the only reasonably price alternative. We will have a photo of the float building frame on the next blog issue. When I make the plans available for this boat, I will include DXF files for most of the components so builders with access to a CNC router can build in plywood without having to loft the panels and bulkheads. Well I have started work on the Scarab 32. 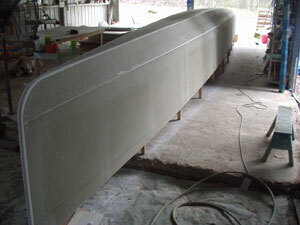 Have just finished building the beam mould. Fran has ordered the materials for the beams and will start building the first one next week. While she is building beams I will be lofting templates for the float hull panels. I am making templates as I think we may end up building at least one other Scarab 32. My original idea was to have the Scarab 22 finished and out of the shed but have had a change of plans. This is all due to Fran's excellent skills as a project manager. A shortage of shed space. 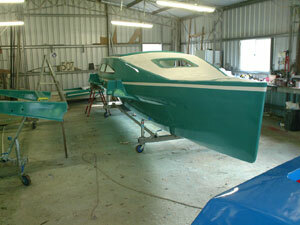 I have been working flat out finishing up a Scarab 350 that Fran built a few years ago. 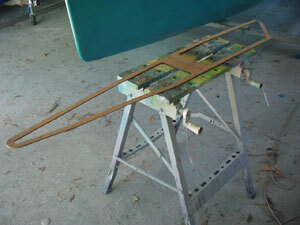 The inside needed painting, beams mounted to the deck, floats attached to the beams and the rudder assembled. Lots of small jobs but they all take time. 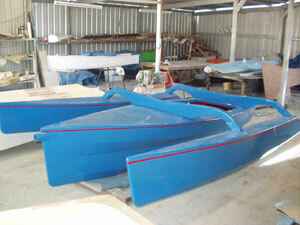 You will see the main hulls of the two moulded 12 footers in the background. We need to finish off all of these boats including the Scarab 22 to get back some shed space so that work can start on the Scarab 32. Once this project has started it will be �all stops out� to get it finished and into the water with hopefully NO interruptions. 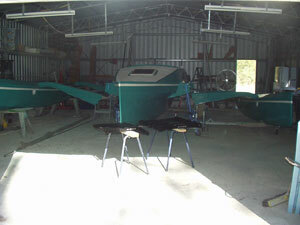 The main hull will be built by me in our large shed where the Scarab 22 now resides (ready to be finally assembled) and the floats and beams will be built by Fran in the smaller shed where all the little Scarabs are waiting. I have decided to design and build a 32 foot tri. It will be folding for docking but not trailerable. I will design it for plywood construction with DXF files available for laser cutting or CNC routing, but will build in foam and polyester. The preliminary design has been started and I expect to have some study plans available in the next few months at $15 AUD. This design will be available for the usual very competitive price of $150 AUD and $60 AUD for the DXF files. See an accomodation layout for this design. All the components for the folding system have been assembled using lots of tefgel between the stainless bolts and the alloy arms. The photos show the assemblies in the foreground with the beastie in the background. 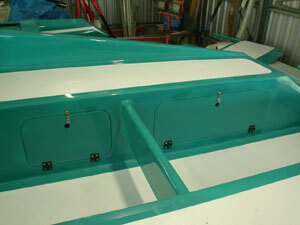 We will be pulling the main hull onto the trailer soon and finally attaching the float assemblies to the main hull. Finally got around to installing the windows on the Scarab 22. I have had to spend four weeks in Sydney over the last 2 months with family health issues and this has slowed down progress. The windows were made some time ago using a template that I made. It doubled for marking out the openings in the cabin side and marking out the acrylic including the mounting holes. The protective paper backing on the acrylic needs to be removed where the sikaflex bonds the window to the cabin side and this cut with a very sharp knife. Use just enough pressure to score the paper and it will tear away cleanly. 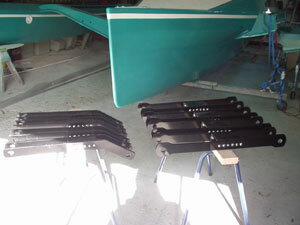 Sikaflex primer was then painted on the contact surfaces and allowed to dry. Sikaflex was then applied to the window and the window attached to the cabin side. Fran was inside the boat with a spanner(wrench) as I used 3/16" CSK screws with acorn/dome nuts for fixing. The remainder of the backing paper was removed after the sikaflex had cured. 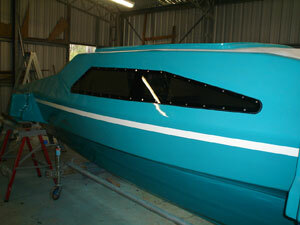 I have been doing a bit of work on the SCARAB 22 again this week. 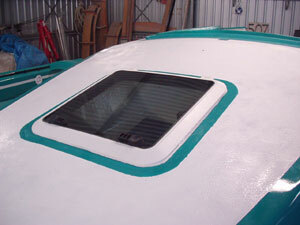 One of the jobs was to install the fore hatch. The hatch is a BOMAR tinted production model. It is very well made and can be opened from inside or outside once unlocked and has adjustable stays each side to hold open at any required angle. I used pan head screws with dome or �acorn� nuts on the inside; they give a nice smooth finish to the fastenings. Next job will be attaching the windows, more on that with photos later in the week. Cockpit locker doors and anchor locker hatch fitted. 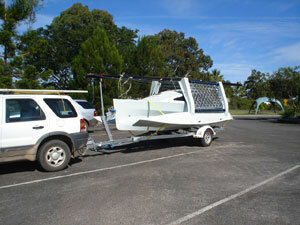 We finally launched the Scarab 18 MAGIC SCARAB yesterday. After many weather related delays (floods, cyclone and lately strong wind warnings) Fran and I launched her at Tin Can Bay, Queensland. Not sure if the crowd at the ramp was a normal Sunday turn out or if it was a fishing comp but the car park was almost full. It has been about 4 months since I built the rig and the old brain was working overtime trying to remember how it all went together. 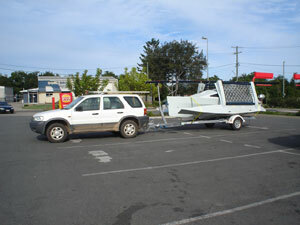 Well we launched her between dozens of stink boats coming and going on the ramp (lucky it is 3 trailers wide). After unfolding at the beach next to the ramp we were pushed off by John who has the first Scarab 18, he was at the ramp and thought the boat looked familiar (John has not quite finished rigging his Scarab). We motored out into the bay before raising the sails, I have fitted a new Honda 2hp 4 stroke short shaft and it worked really well. I thought that 2hp might be borderline but it pushes the boat along with no problems. 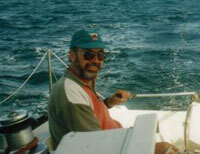 The wind was almost non existent, about 0 to less than 10 knots but the boat sailed well. I saw 11.5kph on the GPS which equates to just over 6 knots and considering the wind strength that was very pleasing for a first sail. There are some minor adjustments required to the rig. I need to develop a better tensioning system for the jib and main halyards and change the angle of the main sheet exit. The boat tacks well, I reckon as good as a dinghy. She can be thrown about onto a new tack without some of the multihull quirks such as having to sail the boat around and at the same time letting out the mainsail until making way on the new tack. The �A� frame that I made for raising and lowering the mast worked well, Fran can do it all by herself with me up on deck just guiding the mast out of or into it�s support between the aft beams. 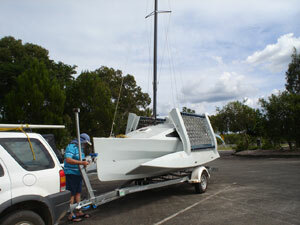 There will be another test sail with a write up soon. 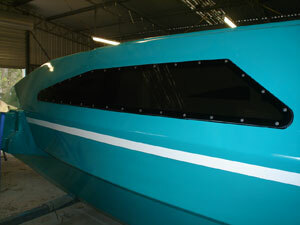 This week I have been making some progress on finishing off the Scarab 22. I have attached the aluminium tube to the starboard float for the trampoline fixing. The tube is a 25mm OD x 3mm wall and is attached with 25mm x 3mm aluminium saddles, these saddles were fabricated using a jig made from a 25mm dia solid rod and a bench vice and after fabrication painted black. I could have used anodised aluminium strip but thought that the anodising would be damaged bending it around the rod in the jig. The saddles were screwed down to threaded aluminium plates previously bonded (sikaflex) to the inside of the float. The plates were bonded in as the float was being constructed. Tefgel was used between the threads of the stainless steel screws and the aluminium plates so they may be removed at a later date if required. 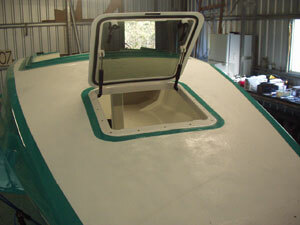 Most of the painting on the exterior of the Scarab 22 has been done. 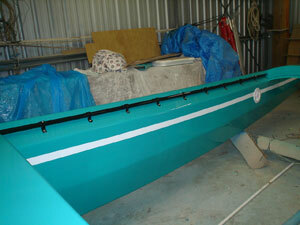 I have painted the blackground to the acrylic windows and a white stripe to match the floats. This is the first of my ramblings for 2011. Today we have no internet and no phone coverage; it must be something to do Brisbane going under as I think the service provider is based in Brisbane. This blog will have to wait until the internet comes back on before it is posted. So far this month we have had over 650mm of rain, the annual average is about 900mm so we have had more than two thirds of the annual rain fall in less than two weeks. Last Friday we had 325mm overnight which resulted in us being flooded in for 3 days. We can get out to the highway now but cannot go far. Gympie (45km south) is under water and Maryborough (45km north) is almost cut off. Petrol and food is almost impossible to obtain so we are just using what we have in the cupboards and freezer. The dog might be eating porridge in two days time. Thankfully we have not been affected as badly as other Queenslanders. 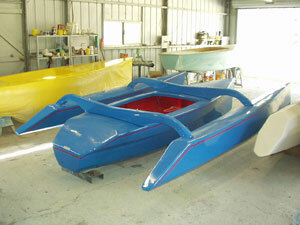 We are finishing off a Scarab 22, trying to fit the paint job in between rainy days and very high humidity. 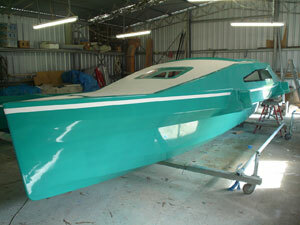 This project has stalled until the weather improves but when finished the 22 will be for sale. The 18 is still sitting in the yard like an ark waiting for the tide to rise, it has seen plenty of fresh water but still waiting for the salty variety. I hope I will have more positive news next time.